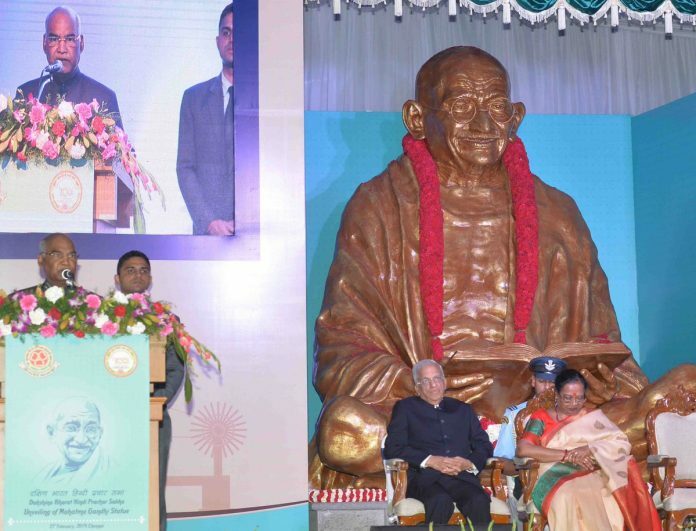 Chennai: The President of India, Shri Ram Nath Kovind, unveiled a statue of Mahatma Gandhi at the Dakshina Bharat Hindi Prachar Sabha in Chennai today (February 21, 2019). Delivering a speech in three languages – Tamil, English and Hindi – on the occasion, the President said that it is a matter of immense happiness that the Dakshina Bharat Hindi Prachar Sabha, founded by Mahatma Gandhi, has completed 100 years. It has worked for the promotion of Hindi in our southern states. By putting up a statue of Mahatma Gandhi, the Sabha has paid respects to the Father of the Nation in his 150th year. The President said that learning the language of another region or another state can be very educative. It can open a window to a culture that is at once familiar and new. In Delhi, he had observed cases of north Indian school-children learning Tamil. He said that twinning programmes between different states are popularising the language of one region in another. Such steps reinforce national harmony. The President said that during our freedom movement, the poetry of Subramania Bharati inspired not just people in Tamil Nadu but all over the country. In the same manner, the liberating ideas of Periyar– one of our foremost advocates of human dignity – were not limited by language or geography. He also recalled that two of his predecessors in Rashtrapati Bhavan, Chakravarti Rajagopalachari, who was our last Governor-General, and President R. Venkataraman, were multilingual intellectuals from Tamil Nadu whose contributions and ideas went beyond any one language or region. The President said that there is a practical benefit to learning languages of other states. We live in an age when a growing Indian economy is leading to significant internal migration. Young men and women from one part of the country are studying or working and adding value to another part of the country. In such cases, knowing the language of the state or region one is located in can only be an asset. It adds value to an individual’s CV – and it adds value to India.